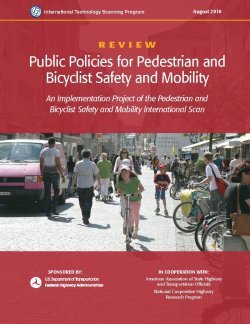 In May 2009, a team of 12 transportation professionals from the United States with expertise in bicycling and walking visited five countries in Europe to identify and assess effective approaches to improve pedestrian and bicyclist safety and mobility. The countries visited — Denmark, Germany, Sweden, Switzerland, and the United Kingdom — were chosen because of their innovative approaches to pedestrian and bicycle transportation, as well as the potential transferability of their policies and practices. Later in 2009, the international scan team developed a summary report that outlined its findings and a list of recommended implementation actions. One of the highest rated implementation actions was the development of a policy review for bicycling and walking safety and mobility. This report is the result of that recommended implementation action.